Splash Damage's Paul Wedgwood says that despite investing plenty of cash in Brink, Bethesda isn't constantly peering over the developer's shoulder. You might know Splash Damage best from its previous collaborations with id Software on Return to Castle Wolfenstein and Doom 3 and well as the Enemy Territory games. Class-based, multiplayer shooter Brink is the developer's first original IP, and founder Wedgwood says that its relationship with publisher Bethesda makes it easy to focus on making a good game. Wedgwood said that Bethesda took a hand-off approach with the studio, allowing it to make its own decisions and be creative. He said that he didn't have the sense that Bethesda was "policing" Splash Damage's design intentions, or was going to try and tell the studio what it should or shouldn't do. "It's just about making a game where not only does the player not want a refund," he said. "But they're going to tell all their friends to go out and get it as well." Wedgwood adds that this openness goes both ways, and that Splash Damage kept its doors open, so that anytime Bethesda did want to come and look at the game, it could. "I think as long as you have that very open relationship with a publisher then it tends to just lead to good things," he explained. 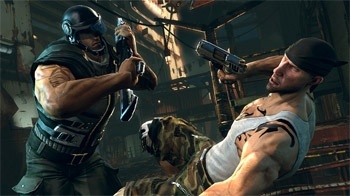 Brink comes out for PC, PS3 and Xbox 360 in Spring 2011.